Jan 21, 2009 (DVB)–While meteorologists in India have forecast freezing temperatures in northern India and Burma, a Burmese official has denied that there is anything unusual about the unseasonably cold weather. Indian newspapers have published advice from the government on how the public should protect themselves against the severe weather conditions. Tun Lwin, director of Burma’s Department of Meteorology and Hydrology, said the cold spell was not unusual for this time of year. “It is likely to be cold up until the end of the month but it is a regular cold season. It is not really anything new. 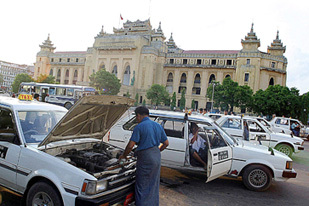 There is no record breaking temperature,” Tun Lwin said. “Temperatures have dropped to freezing point in places like Hakha [the capital of Chin state in western Burma] but that is normal,” he said. The Burmese meteorology department has issued daily weather reports since 1988, but it has never issued warnings of predicted heat waves or cold snaps. Before Cyclone Nargis hit Burma last year, the department dismissed warnings from its Indian counterparts and the American naval typhoon warning centre in Guam and said there would be no unusual conditions. Cold weather warnings have also been issued in neighbouring Thailand, where the government last week declared emergency zones across much of the north of the country. Jan 15, 2009 (DVB)–Provincial and township administration officials in Zalun township have been dismissed after junta leader senior general Than Shwe was left disappointed by his trip to the Irrawaddy town at the end of last year. 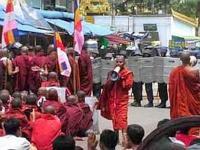 A Zalun resident told DVB that State Peace and Development Council leader Than Shwe, who visited the town on 30 December 2008, had not been greeted by local residents and government employees when he arrived. 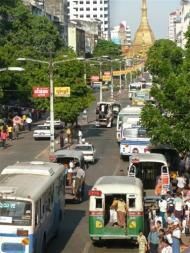 “[Than Shwe] was very disappointed as he was not greeted by anyone on his arrival to the town,” the local resident said. If someone we love visits our town, then the whole town will come out and greet him or her without any orders from anyone,” he said. The Zalun resident said the SPDC leader was also disappointed when he visited the historic Zalun pagoda in the town to light candles and pay homage. “The lighter prepared for him by the pagoda administration didn’t work when he tried to light the candles,” the resident said. “He was very angry about that and now we are hearing rumours that the pagoda administration staff are going to be fired too,” he went on. “All the lighters at the pagoda had been specially prepared for him so there should have been no problems with them normally,” he said. Some town residents speculated that the sacking of local administration officials could also have been due to the low number of ‘Yes’ votes during the May 2008 constitutional referendum in Zalun, Hinthada and Lay Myat Hnar townships. Zalun township PDC was unavailable for comment. NB.- For those inside Burma, who cannot reach this story’s original website, DVB. New Delhi – Burmese junta authorities on Saturday arrested nine members of the opposition party – the National League for Democracy – who were travelling to attend the 20th anniversary celebration of the party’s founding day, the party spokesperson said. Nyan Win, spokesperson of the NLD said nine of his party members including Htet Htet Oo Wai and Daw Shan Ma were rounded up by plainclothes security personnel as they stepped off a bus near the NLD head office in Shwegondine Street in Bahan Township. “They were picked up by plainclothes policemen. We don’t know the names of the other seven,” Nyan Win said. The NLD spokesperson said, at least a thousand plainclothes security personnel were present in and around the party office as members marked the 20th anniversary of the party’s founding day. The security personnel also took video footage and still photographs of the people attending the function. “There were about 500 people attending the 20th anniversary day but I think the security people were double our number,” Nyan Win said. The anniversary function was also attended by the recently released veteran journalist and the NLD party founding member U Win Tin, Khin Maung Swe and Dr Than Nyien. During the function, the current party Chairman Aung Shwe requested Win Tin, Khin Swe and Dr. Than Nyien to resume their old positions and their work with the party. Win Tin, who was detained for over 19 years, and Khin Maung Swe, earlier served as NLD’s central committee members before they were arrested while Dr. Than Nyien was the vice-chairman of the Rangoon Division NLD. Win Tin, the veteran journalist, said he welcomed the offer made by the NLD chairman as he had always supported the party. “I have always exhorted the people to support the NLD and Daw Aung San Suu Kyi. So, we accept the offer in principle but I am not sure when we can actually take up the responsibility because we have to do a lot of work to catch up with,” Win Tin told Mizzima over telephone after the function. But he said, the first thing that the three of them would like to do is to fight for freedom of the remaining political prisoners, who are continuously suffering under deplorable prison conditions. “It will include demanding the release of Daw Aung San Suu Kyi and U Tin Oo, and when they are freed, we will continue urging for a political dialogue,” Win Tin said. According to the Thailand based Assistant Association of Political Prisoners (AAPP), there are over 2,000 political prisoners including student leader Min Ko Naing and his 88 generation colleagues, still languishing in prisons across Burma. Meanwhile, Nyan Win said, the party is proud to be able to celebrate its 20th anniversary despite the ruling junta’s severe crackdown on its party members. “I, personally, am very satisfied with what the NLD party has been able to do so far. For the past 20 years, despite severe repression by the government, the NLD is being able to maintain its stand as a political opposition party,” Nyan Win said. He added that the party will continue to uphold its principle of fighting for democracy and human rights in the country through non-violent means. Nine members of the National League for Democracy were arrested today at a ceremony to mark the party’s 20th anniversary, according to NLD information committee member Dr Win Naing. Ma Htet Htet Oo Wai and Daw Shan Ma from Shwepyitha township were among those arrested, along with six unnamed youth members and a middle-aged woman. 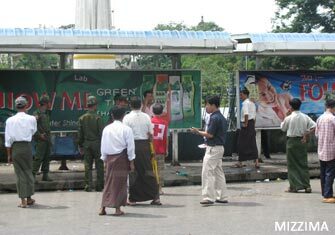 Six people were arrested before the ceremony at a bus stop near the Yazana hotel adjacent to the NLD headquarters as soon as they got off the bus, while three others were detained after the event. Around 500 people attended the event, which began at 12 noon. Some youth and women members wearing yellow shirts lined up in front of the NLD headquarter to commemorate the monk-led demonstrations that were brutally crushed a year ago. Newly-released political prisoners U Win Tin and U Khin Maung Swe were reinstated in their previous positions, while Dr Thein Nyein was re-appointed deputy chair of Rangoon division NLD. U Win Tin gave a speech at the ceremony demanding the release of all political prisoners, claiming that those who had been released felt ashamed that others were still not free, and called for unity among political groups. There has been heavy security on Shwegondaing road and around the NLD headquarters, with soldiers, police and Swan Arr Shin members standing by on trucks. Rangoon (dpa) – The military government arrested at least three National League for Democracy (NLD) supporters Saturday before the opposition party celebrated its 20-year anniversary, witnesses said. 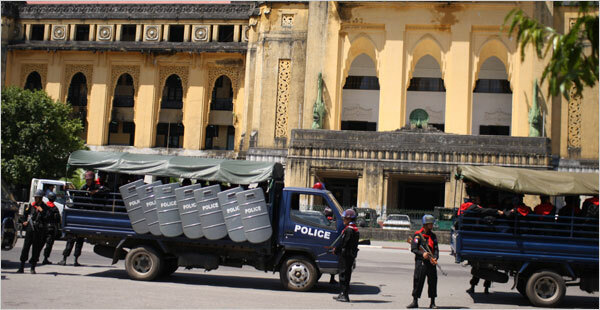 Police detained two men and one women near the NLD headquarters before the anniversary ceremony to mark the establishment of the party in 1988. Before the ceremony about 10 people shouted slogans including “Free Aung San Suu Kyi” and released birds from cages in front of the NLD headquarters, but it was unclear if those arrested were part of that group. Journalist U Win Tin, 79, who was released from 19 years in prison last Tuesday, attended the anniversary celebration for his first time, having been in prison on all the previous anniversaries. He said he would help NLD and its leader Suu Kyi in the struggle for democracy. The Nobel Peace Prize laureate Suu Kyi remained under house arrest and could not attend the ceremony. She has been under house arrest for 13 of the last 19 years. Before U Win Tin was released last Tuesday, as part of a broad amnesty that freed 9,002 prisoners, he was Burma‘s longest-serving political prisoner. Two NLD members who were also released on Tuesday, U Khin Maung Swe and Dr Than Nyein, also Saturday’s attended celebration. Missing from the ceremony was NLD member Win Htien who was one of the 9,002 released last Tuesday, but was arrested again less than a day later. Win Htien was a founding member of the NLD in 1988. U Aung Shwe also called for the release of all other political prisoners. The United Nations puts that number at about 2,000. While the junta holds absolute power in Burma, the international community still supports Suu Kyi as the most credible leader of the country. The NLD won the 1990 elections in a landslide, but the junta refused to recognize the results. Photo – Nicknayman, AljaeeraMizzima, AFP and IHT. “ေသတာေတာ့ မရွိဘူး။ ဒဏ္ရာရတာ အားလံုးေပါင္း ၄ ေယာက္ပဲ၊ နာမည္ေတြေတာ့ မသိဘူး” ဟု ေဆးရံုၾကီးမွ တာ၀န္က် ၀န္ထမ္းတဦးက မဇၩိမကို ေျပာျပသည္။ သို႔ေသာ္ ေျဖဆိုခြင့္မရွိသျဖင့္ အေသးစိတ္ေျဖၾကားရန္ ျငင္းဆန္…..